COM and Carriers Modules Archives - SLN Technologies Pvt Ltd. The M671R is a new ETX™ CPU module designed by SECO, paying attention to customers requiring very high performances. The module is based on the Pentium® M CPU up to 1.8 GHz frequency, with Chipset Intel® 855GME (Intel® 852GME on the CM 600 MHz version) and front side bus at 400 MHz. The chipset has an integrated 2D/3D graphic controller, supporting AGP4x interface. An important feature in this module is the LVDS interface at 18bit Single and Dual Channel. The module integrates also Audio, Ultra-ATA/100 IDE interface, 1 Ethernet 10/100 BaseT, 4 USB 2.0 ports, 2 Full modem serial ports, 1 standard parallel, keyboard/mouse controllers, Real Time Clock and Watch Dog Timer. The ETX™ module is connected to the rest of the embedded system through 4 high density connectors that carry both ISA and PCI bus signals to a motherboard, where I/O connectors are placed, according to the customer requirements. The M647R is a compact general purpose baseboard designed to be an easy solution for the use of ETX™ modules. With its CC-Talk interface it’s also suitable for gaming applications. It’s possible to mount on board up to 512MB Flash Disk modules. 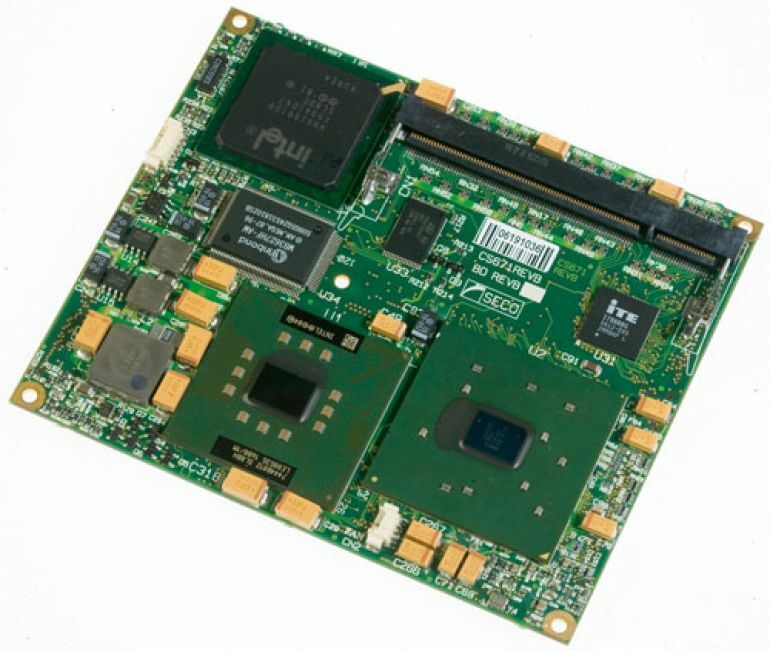 The M647R is well equipped with 2.5″ HDD connector, LVDS, VGA, 4 USB and Ethernet ports. The board can receive + 12V power supply directly through a Molex minifit connector or through a Kycon KPJX-4S connector plus relay and remote power button. The M682R is a compact baseboard designed to be a solution for the use of ETX™ modules. With its Mini PCI socket soldered on board it’s also suitable for applications that require Wi-Fi connections. Its very small dimensions are also the main characteristic that enables the use in wide range of products of ETX™ CPU modules.